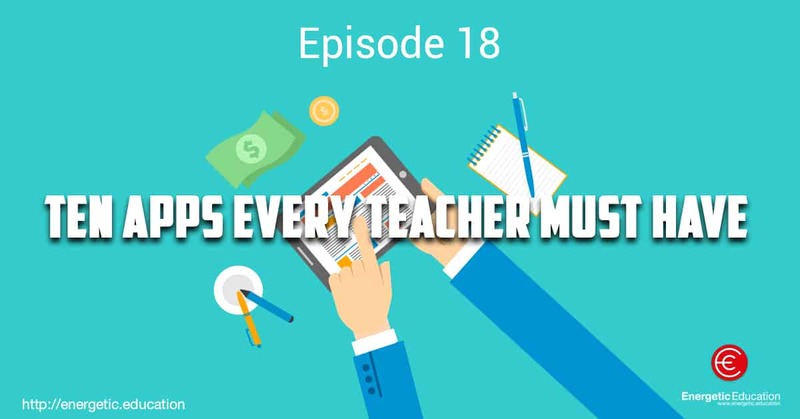 In today’s podcast we cover ten amazing apps that will benefit all teachers. Some of these will be house hold names, as they are truly amazing, whereas others are little gems that you have never heard of before. We have tried to give an honest description of each app and their benefits to the classroom. Twitter is more than just a social media site. It is an excellent way for teachers to keep parents and students updated on class progress as well as what is coming up. You can tweet assignment due dates, test dates, plan field trips, post syllabus changes, and more. It is also a great way to send out supplementary information to parents and students including links to articles and news stories. It is a simple way of allowing students to ask questions during a lecture, take and share notes with classmates. It can be used to engage in conversation with classes all over the globe. Classroom Teammates will bring gamification tools to your classroom and will let you create teams randomly or manually in no time. Import students from a CSV/XLS file, from Google Classroom, from your contacts, from iDoceo or Classroom Badge Maker and have your teams ready right away. Classroom Teammates is an universal app that syncs your data automatically between your devices (iPhone, iPad and iPod touch). This is the best app on the market for selecting and picking groups in the classroom, it has a number of functions to make these as fair and stress free as possible for the teacher. ClassDojo is a free app for quick and effective behaviour monitoring. Each students name and avatar is entered into the system. The app allows teachers to record both positive and negative behaviours. There are present categories including on task, helping others, no homework, and unprepared among others. You have the ability to add additional categories at your discretion. Teachers simply click the boxes that apply to each student. In addition, teachers will benefit from a quick summary of each students behaviour to refer to as needed. Finally, it prepares a pie-graph report that is sent out to parents on Fridays detailing weekly behaviour. This is the ultimate in digital communication, this free app will change the way you communicate with everyone. You can set up class groups, teacher year groups etc. Slack also has the benefits of a Facebook group, plus wonderful integration with Google Docs and Google Hangouts if these are platforms that your school uses. We highly recommend giving slack a try. Class Break features over 200 different activities and games that are outside the traditional PE class games of kickball and volleyball. It also features team building exercises, brainteasers and more. Teachers will find this app ideal for students who are having trouble with concentration spans during boring assignments. Simply take ten minutes and allow students to participate in a few of the brain exercises to increase their focus. Additionally, many of the physical activities can be done in the classroom, which is ideal for rainy days when recess is cancelled. Easy PD makes tracking of professional development easy. It tracks the number of hours that you have completed and takes a screenshot of your results for verification. Teachers will find it much easier than attempting to keep track of paper certificates. Also, records can be sent via email to the teacher or supervisor. This is just one of the amazing apps from Jarrod Robinson (The PE Geek). The number one message that we promote with our teaching, workshops mentoring, is presenting learning in a game format. The app Kahtoos allows you to create a game show like atmosphere in your classroom, with amazing quizzes and tests, students can also create their own quizzes for each other. The possibilities are endless, kahoots can transform your lesson into a game show that television networks would be proud to run. Bit Breaker is a free app, which places students into the middle of an arcade type game. Physical movements are tracked by your device and send students through a game with the goal of breaking bricks. Students will be required to move around, steer a paddle, and jump around continuously. It also incorporates video games (which many students love) with physical activity. It may encourage students that are not as interested in physical activity by allowing them to do something they enjoy. Halftone 2 or comic life 3. Both these apps allow teachers and students to easily create comic books. It includes options from font, caption styles, layouts, and stamps to allow teachers and students to showcase their creativity. It also gives them the option of incorporating their own photos into the story. Teachers will find this app is creative and fun to use in the classroom. It can be utilised in a variety of ways including creative writing assignments, demonstrating mastery of a subject, or anything else you can think of. I personally use Halftone to create posters and forms for class rules or certain skills. Yoga Studio costs is ideal for teachers who want to incorporate yoga into their classes. It offers numerous videos to choose from and provides a demonstration of over 300 poses with detailed instructions, you can customise lessons to fit certain levels and period lengths. It can be projected onto a board to show students different yoga poses whilst allowing the teacher to walk around and make sure everyone is doing them correctly. If you have a spare two minutes we would love a review on iTunes if you are loving our podcast. Thank you very much and have a great day.